If you’ve ever been involved in a motorcycle accident, then you probably know just how chaotic the aftermath of such a catastrophe can be. Immediately after a collision, it’s likely that all parties involved will experience a rush of emotions like fear, panic, anger, relief, sadness, regret or even guilt. People may be injured, and property may be significantly damaged. Always reach out to the police when these conditions are present. They will create a report of the incident and help anyone injured. Afterwards, it may be time to begin thinking about the next steps in reporting the accident. There are situations in which you won’t need to notify your insurance company about an accident. These types of accidents usually do not involve injuries or significant property damage. 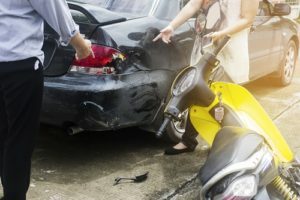 If there is any possibility of injuries arising in the future, then it may be prudent to notify your insurance company about the accident promptly. It’s best to contact your insurance company in any situation where you believe a claim might be filed in the future. When there is a possibility that the other party may seek a claim, your insurance company needs to know. There are plenty of reasons why someone might not want to involve their insurance company in an accident. Many fear that their monthly rates will rise, and others dislike the idea of having a minor accident listed on their insurance driving record forever. Despite these valid concerns, it’s necessary to notify your insurance company when you or someone else has sustained serious injury or property damage. If the accident was someone else’s fault, then make sure to let the agent you speak with know. Provide the agent with any details you can remember including witnesses, what was damaged and who was injured. Be as honest as possible when speaking with the representative because there is a possibility of a future investigation into the accident being opened by the insurance company. If one or more parties involved seeks out a claim, then the insurance companies will likely begin investigating the situation. You may be contacted by representatives, and it’s important to cooperate with their requests. They may need to inspect your property or view medical records related to injuries.